Swine flu has been getting lots of media mileage nowadays. You are probably wondering how to differentiate swine flu from human seasonal flu or regular flu. While both strains of flu have similar symptoms, they have slight but very significant differences that you should understand. First of all, a regular flu is endemic to human population. All three influenza types (A, B, and C) are strains that came from human. Swine flu is different. It is a specific strain that has an animal origin specifically from pigs. Due to unknown mutation process, the flu virus jumped from pig to human thus resulting to the new swine flu strain known as swine flu (AH1N1). This particular strain is a combination of three types of flu: human, avian, and swine. It should be noted that regular flu is deadlier than swine flu. The common human seasonal flu kills more than 36,000 people annually. In contrast, the fatalities from swine flu are nowhere near the number of people killed by common flu. Common human seasonal flu affects elderly people. Because this flu virus has been in existence for so many centuries already, the human body develops a natural defense mechanism against it. That is why elderly people who have weaker immune systems are prone to common flu. In contrast, swine flu impacts mostly on younger population with robust and healthy conditions. This is a danger signal that is why medical experts are scrambling for effective treatments and solutions against swine flu. One significant difference is the level of strength of each virus as it transfers from one person to another. Common flu does not grow weaker when it transfers from one person to another. On the other hand, swine flu becomes weaker during transmission. Flu and swine flu may have similar symptoms. But they have peculiar differences in terms of origin and impact on people. 1. 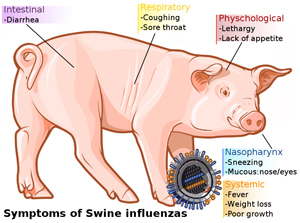 Swine flu has an animal origin speicifcaly from pigs. 2. The fatalities fo common flu is much higher than Swine flu. 3. Swine flu could affect younger people with good health unlike swine flu. 4. Swine flu virus becomes weaker when it transfers from one person to another. Influenza Vaccines: “Flu-Shot” or “Nasal Spray”- Do they differ? Mabelle. "Difference Between Flu and Swine Flu." DifferenceBetween.net. August 29, 2017 < http://www.differencebetween.net/science/health/difference-between-flu-and-swine-flu/ >. WARNING: Safety and effectiveness of Influenza A (H1N1) 2009 Monovalent Vaccine have not been established in pregnant women or nursing mothers or children <6 months of age. References from the CDC included in the above link. Seeing is believing so take a look not only for yourself, but for your family as well. and offline sources that he/her ends up confused. the most basic information in comparison to another.